"Friendly Fridays... 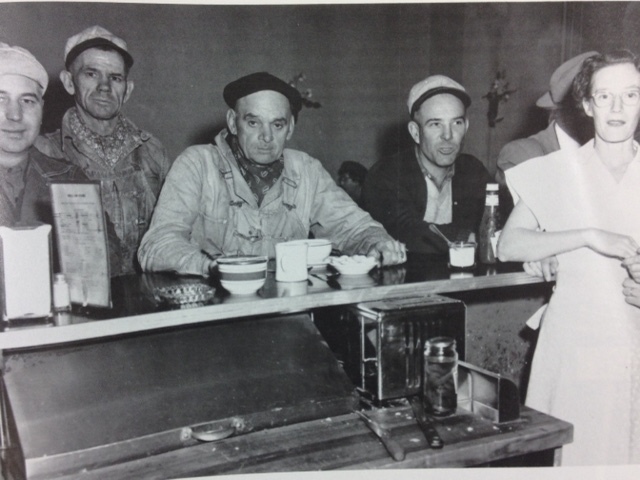 The D&H Sonnyvale Branch." Kip Grant has both the voice and the cool sounding name to be an on-air radio personality. Good thing too, because he was for many years. 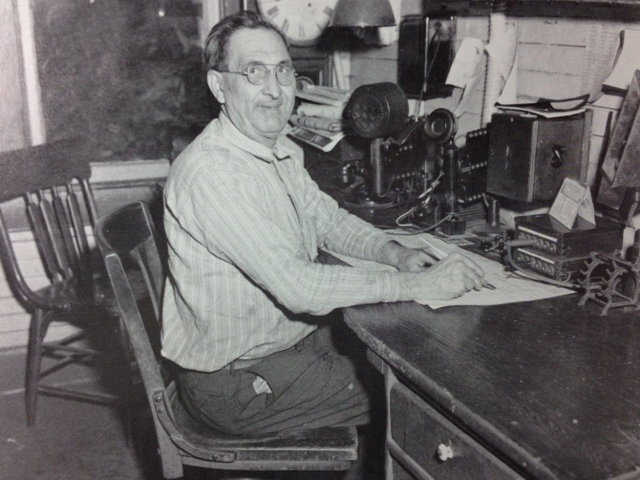 But you may know him from his 'other' job... designing, building and operating the prototypically-inspired Sonnyvale Branch of the Delaware & Hudson. 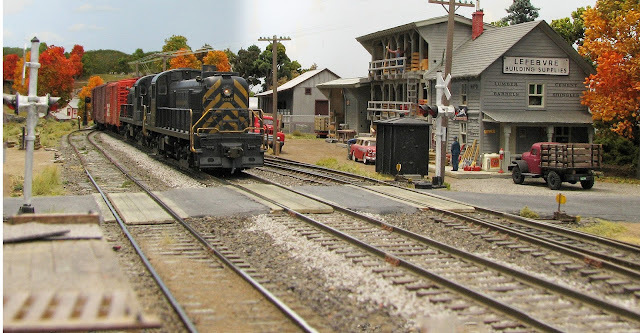 His 13' x 19' layout, named after his dad, is a re-creation of his childhood memories rail-fanning the D&H's upstate New York branch between Fort Edward and Lake George, circa 1962. I was mesmerized the first time I saw it in the 2011 issue of Great Model Railroads. His room size and configuration was similar to that with which I'd be working and I was amazed at what Kip could accomplish in that space. I also took note of the museum-like presentation he afforded his dynamic work of art. Every inch of the finely finished environment was flawless in showcasing the layout. 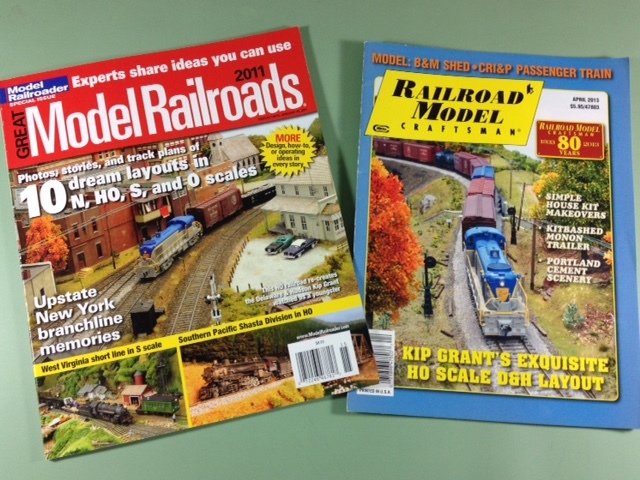 Few modelers are fortunate to be featured in one national magazine, let alone two. But to grace the cover on each occasion is absolutely top drawer. No doubt Kip counts these as two of his proudest moments in the hobby, aside from his inclusion on this blog, of course. The town of Sonnyvale is based on Glens Falls, NY. It is well framed at the end of the walk-in layout within coved walls and a thoughtful treatment with both valence and fascia. The valence utilizes pipe insulation as a protective edging which also gives it a nicely finished touch. The fascia matches the valence, painted a midnight blue... unusual, but it works! Black skirting completes the layout's presentation while perfectly aligned 35mm film canisters are used to recess toggle switches that control all turnouts for convenience and safety. Junction Yard is seen here on the right, while the end of the peninsula is on the left. Kip groups complimentary structures together to depict sizable industries requiring varied loads, enhancing operations. Here the Holly Hill Creamery serves as a backdrop to a local heading out of Junction Yard. But note the real backdrop and the very low horizon line and muted hills beyond the scenic terrain... not to mention the telephone lines. Sweet! If you are familiar with Railway Design Associates' Easton Mill kit you'll recognize that Kip altered the side by skillfully replacing one overhead door with two blocked windows. He added a stone foundation and applied such Tichy details as masonry anchors and rafter tails... and that looks like a chimney from Monster Modelworks, maybe? The volunteer fireman and community fire marshal makes certain that his structures comply to the UCC with red alarm boxes and standpipe connections! Like the creamery, Kip has grouped a couple of compatible structures to serve as one large industry unifying them through a common color scheme and such identical details as railings and signage. 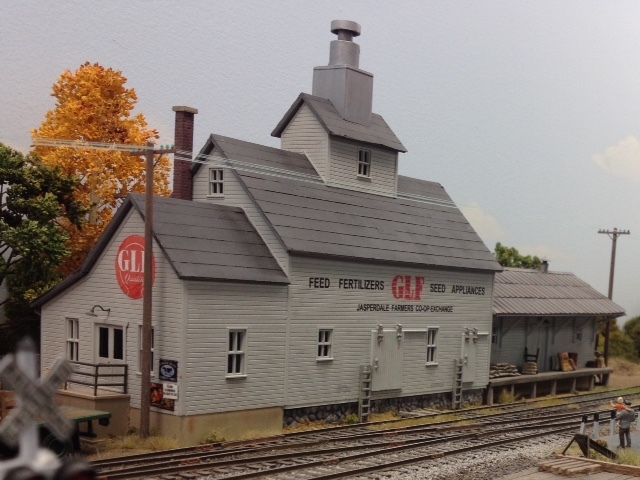 An old D&H paint scheme approaches, passing the Lefebvre Lumber Supply which is an old Art Curren project combining a couple of Atlas Hillside Lumber kits with an AHM American Farmhouse. Kip adds oodles of details to the compilation, and with subtle weathering and custom signage, it's an A-1 model. Specific improvements include the addition of rafter tails and the distressing of the shingle roof edge of the front building. The three principal areas where most switching operations occur are nicely separated with scenic treatment depicting the countryside of upstate New York, like this farm which is a representation of Kip's in-law's. Every scene is detailed and tells a story through its many citizens and vintage vehicles. Tricky early fall foliage has been skillfully depicted without looking too severe as can happen. The unique cross buck design is indeed prototypical. Another enhanced standard styrene kit is the Sunrise Feed Mill from Walthers with custom signage and various applied details. Here, Kip changed the foundation of the central part of the building to suggest the flanking sections were added at a later date. Likewise, the roof of the lowest section has been changed from the kit's rolled tarpaper to a ribbed metal, again suggesting that the business has grown over time. Note the rail-fanning dad and son in the lower right hand corner awaiting some real railroad action. Here's where all of the magic happens! Kip's work area is located just outside of the layout room adjacent to the crew lounge and is ideally equipped with a fully functioning sink, spray booth and a work surface, somewhere or another. Looks like there's even one of those optivisors hanging above, no doubt just to be ready if ever needed in the future. "Each session starts as a new day. 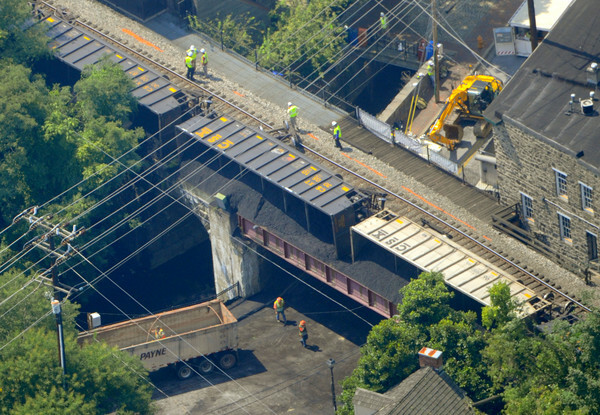 The Junction Yard crew blocks outbound cars which were brought to the yard in the previous session and places them on tracks designated by the yard clerk. Following the session, I play the role of the main line freights and remove the outbounds. Then after selecting appropriate inbound cars in accordance with my software, I place said cars in the yard as if they were set off by other imaginary mainline freights. And the cycle continues." 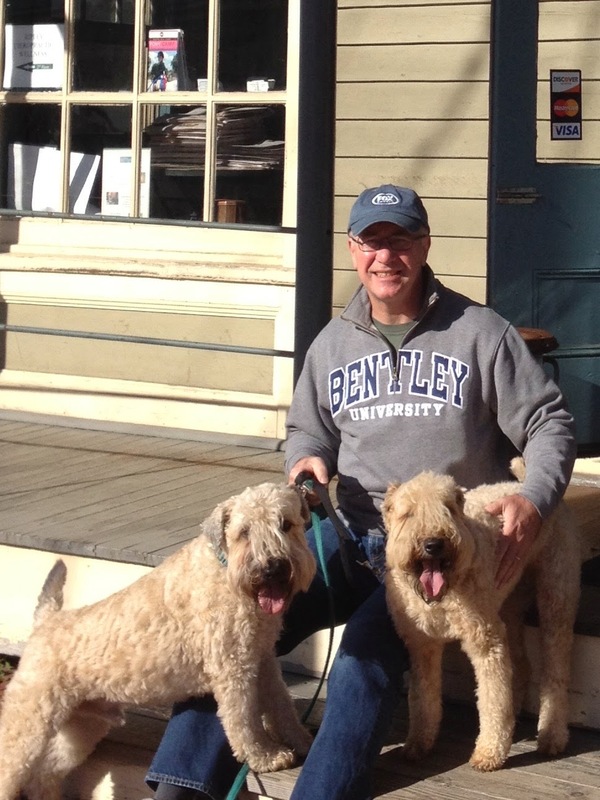 Hey Jim, when's the ideal time of year to visit the Lake George region in upstate New York to see Kip's layout ? A) Spring, when pollen is measured in inches, just like snow. B) Summer, when SUVs from NYC teach locals some new road rules. C) Fall, when busloads of 'leafers' patiently search for the perfect tree. "Three years ago the unthinkable happened... "
It was shortly before midnight, Monday, August 20, 2012. 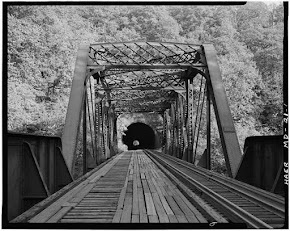 Two 19 year old girls sat on the railroad bridge, feet dangling over Main Street, their backs to the railroad tracks several feet away. They tweeted, "Looking down on old EC." The high school friends would soon be returning to their respective colleges and they were doing what kids in Ellicott City have allegedly done for years, hanging out on the historic trestle on a warm summer night. Then the unthinkable happened. 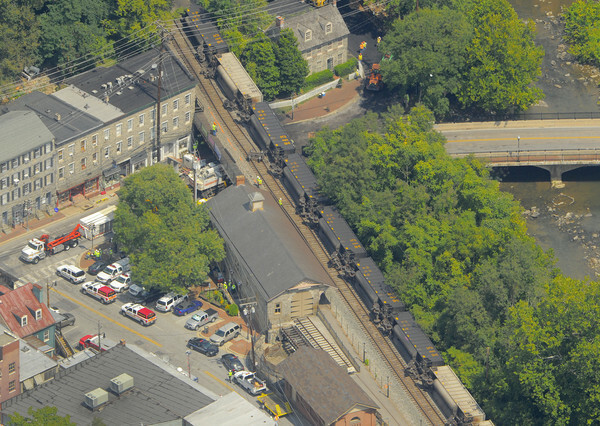 A fully loaded eastbound coal train rounded the bend and descended into town. The first ten cars rumbled past the girls before something went tragically wrong. A string of hoppers derailed, tipping over and burying the pair instantly. 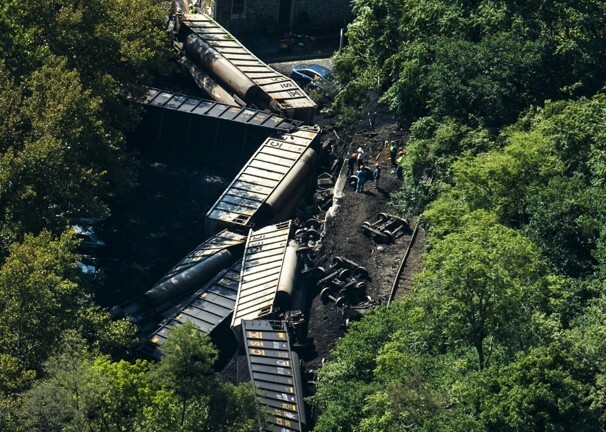 The CSX eastbound train had originated in Grafton, WV and was comprised of 80 fully loaded hoppers pulled by two locomotives. Total weight was estimated at 9,000 tons. 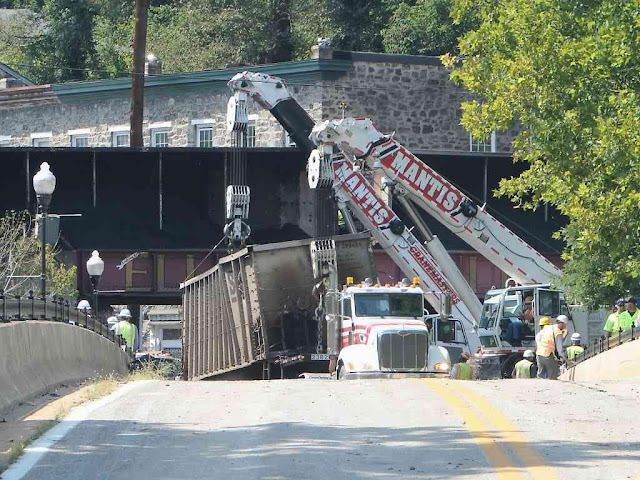 The first 21 cars of the train derailed in the heart of downtown at the historic bridge over Main Street. The girls were in a restricted area accessible by climbing a low fence. All reports confirm that the train was traveling at the 25 MPH speed limit entering town. As a regular visitor to this town my entire life, the tragedy felt weirdly personal, even from 200 miles away. I have stood in that general area many times with my grandfather and just a year earlier with my then-17 year old daughter as part of a college tour to Washington DC. How do those most affected by this, cope with their loss and grasp the random nature of such a bizarrely fateful event? As modelers, it points to a strange reality that when we depict a prototype and a period, we may be dabbling in a story whose innocence will be stolen forever at a later date. It's going to be challenging to depict the Ellicott City bridge at Main Street circa 1960. I will know something about its future that I would prefer not to know. It sure wasn't something I signed up for modeling the Old Main Line. Just a short follow-up on my previous post on selective representation. Andy Rubbo who lives a few towns away here in central New Jersey is doing a brilliant job on his multi-deck depiction of the Pennsylvania Railroad's New York Division, circa 1967. Known to us now as the Northeast Corridor, Andy is faithfully modeling this line that includes some real urban centers including Newark, Elizabeth and Rahway. A couple of photos below show Andy's skills in taking standard DPM kits and turning them into recognizable shops just off of the right-of-way. Signage and a wonderful color palate transform these well-known kits into something special, representative of that which is found in downtown Elizabeth. Note the distinctive worn, white painted brick and the oxidized copper-clad turret! The center structure has been skillfully reduced in width while all three storefronts are enhanced by the sloping roadway. Lintels have been altered and new parapets and roof details have been added to slightly change the appearance of these popular kits. Although Andy is best known for his handiwork in depicting the catenary which dominates the rail line, his talent is evident with all of his structures. He has a keen eye for the little details that help in representing the time and place he is modeling, and he can do so with a combination of scratch-built and kit-bashed structures. As he says, "My aim is for the end result to be recognizable and unmistakable... one that captures the essence of each scene." Hmmmm, sounds just like selective representation. For more on the PRR, check out Great Model Railroads 2013. I don't know the details for the origin of the term selective compression... the who, when, how, etc. And maybe I just don't fully get it, but it always seemed rather limited to me as a descriptive element for what we do as modelers. After all, just about everything about a layout, regardless of scale, is compressed. There isn't a lot of selection going on here sometimes, unless it's selective elimination or selective omission. It may be an acceptable catch-all or a generally agreed upon bon mot, but I need more. It's just too darn tidy. 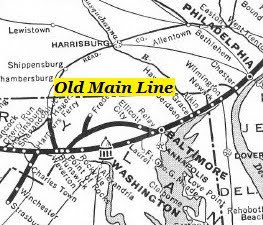 I initially bought into that convenient sounding term in approaching the planning of the Old Main Line, but quickly realized that there was going to be a bit more required to pull this off. Obviously the main line run is compressed, but in assessing the Layout Design Elements I discovered that more decisions would be required. And that is especially evident for a relatively narrow shelf-type layout. In analyzing Ellicott City, the layout's signature area, I concluded that outside of the key ROW buildings, the downtown lacked any real significant identifiers or any one specific structure that defined the town. Shrinking, or compressing a series of structures was not going to accomplish too much. That, combined with limited space, required a compilation of signature elements into a few structures to ultimately convey the downtown. I would humbly suggest that perhaps selective representation might be a good term for this objective. 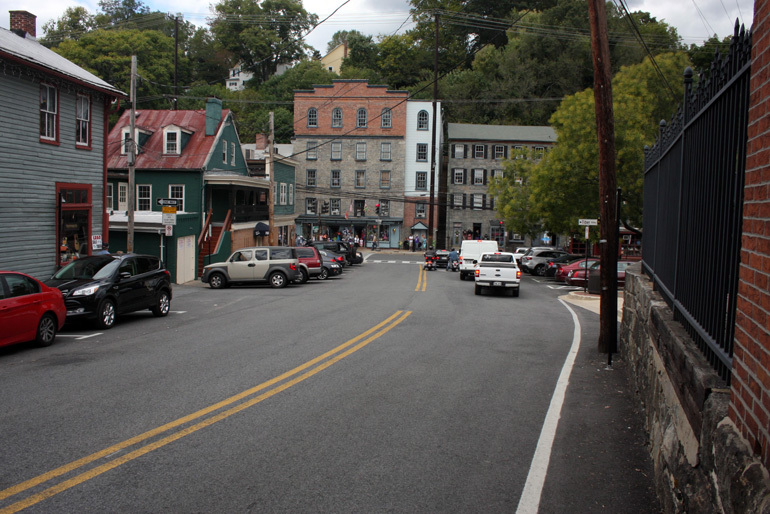 Ellicott City's 19th century buildings were largely built from nearby quarried granite and limestone and tended to be located on the lower part of Main Street adjacent to the railroad. Elements such as metal roofs, doghouse dormers, shutters and the number of divided lights in window sashes tell a story about a building's time and place. Note the off-center storefront which contrasts with the overall symmetry of the structure. More on that below. Photo overviews help to define an area's color palate and distinctive architectural details. 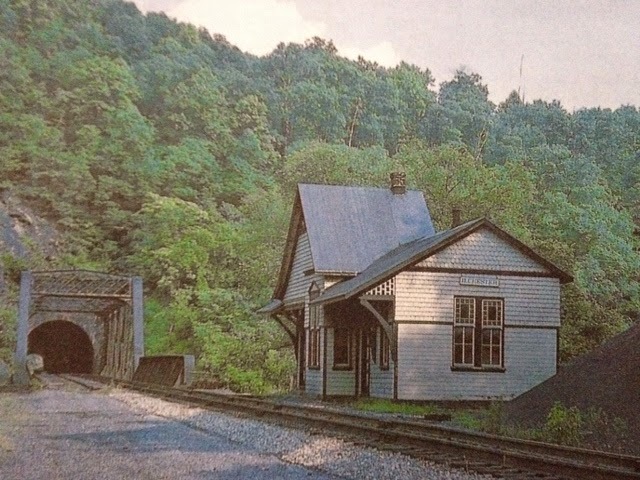 Immediately adjacent to the river and railroad is one of the oldest structures in town. 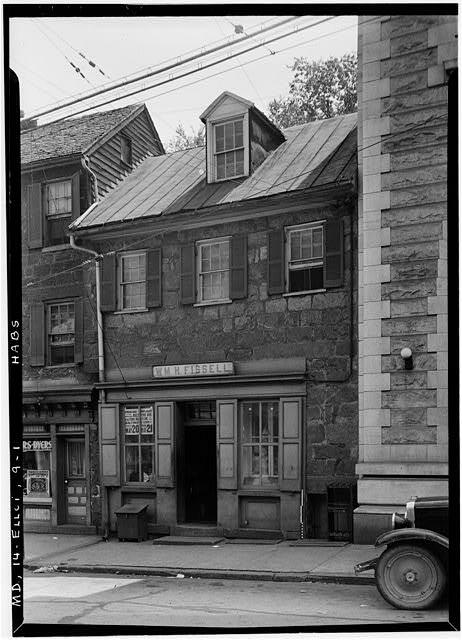 The post-Revolutionary War building is significant by it's twin chimney's, cedar shake roof, 9x9 divided lights and off-center front door. 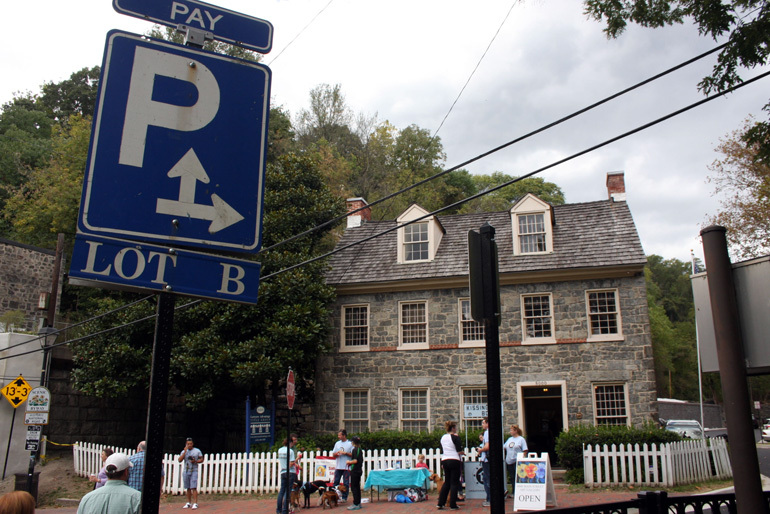 The jarring interruption to pure symmetry was how colonists rejected Georgian architecture that was viewed as too aristocratic. 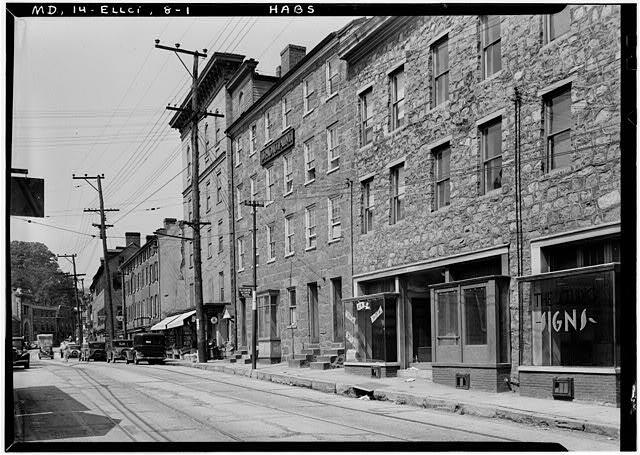 Early 20th century buildings lined the upper part of Main Street and tended to be of brick construction. Any number could have come out right of the Design Preservation Models' catalog. 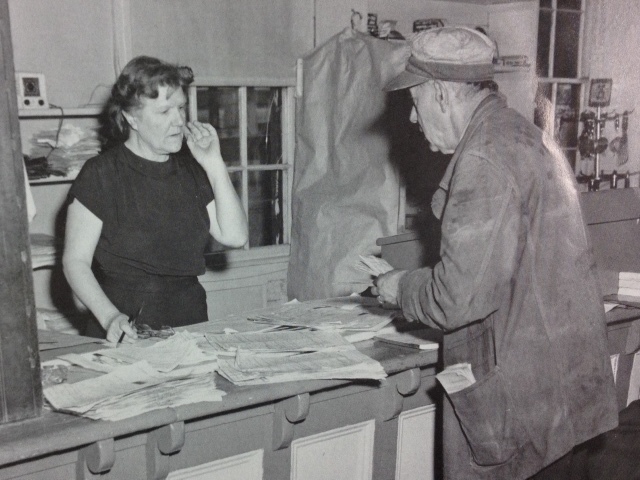 Note especially the cream colored storefront at the rear of this photo. It is very comparable to DPM's Carr's Parts. 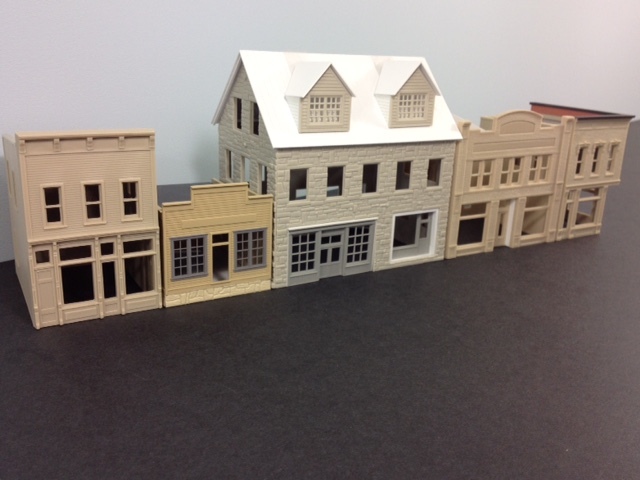 DPM kits serve as a good starting point for any downtown as complimentary background buildings. Adding stone foundations and replacing chunky windows with those from Tichy can improve the look of basic kits like Jim's Repair Shop from Walthers. The large stone structure is a serious kitbash. 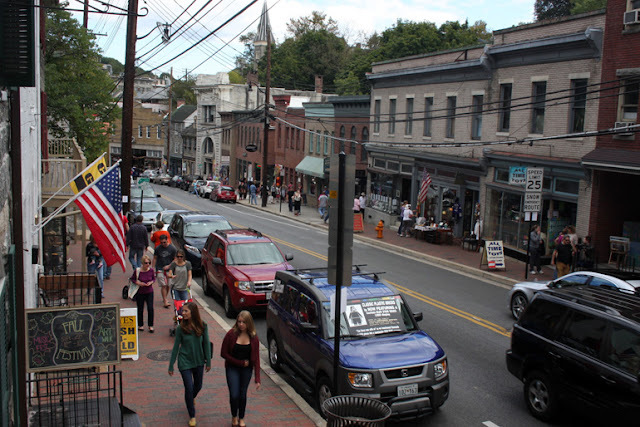 Its dual dormers, metal roof and asymmetrical storefronts will combine some of Ellicott City's most distinctive architectural elements. The well-known DPM kits will be customized starting with a change to their rooflines and/or roof materials. Some brick sheeting and enhanced coping was added to the parapet of Carol's Corner Cafe while Carr's Parts will take advantage of its false front to conceal a pitched tar-paper roof. Skip's Chicken & Ribs had its rear wall trimmed and roof lengthened to provide a more realistic method of drainage for a clapboard-type structure. All window sashes are thinned down through careful filing. 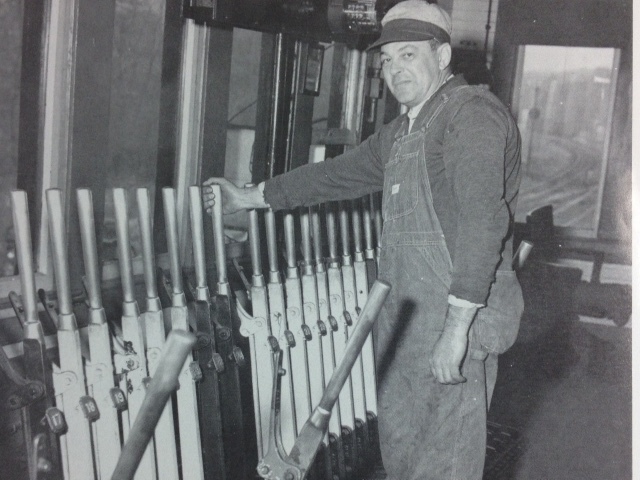 The Freeman Manufacturing Company kit from Railway Design Associates served as the basis for one of the downtown buildings. The ends were trimmed from their original clerestory profile to a traditional gable one, while the front was carefully routed out to accept two storefront facades from the 1970's Heljan Con-Cor Courthouse Square Series. Ultimately, final customization and selective representation will be achieved through color, signage and applied details like awnings, porches and balconies. The siting of the storefronts on the inclined main street will add additional interest and distinction. 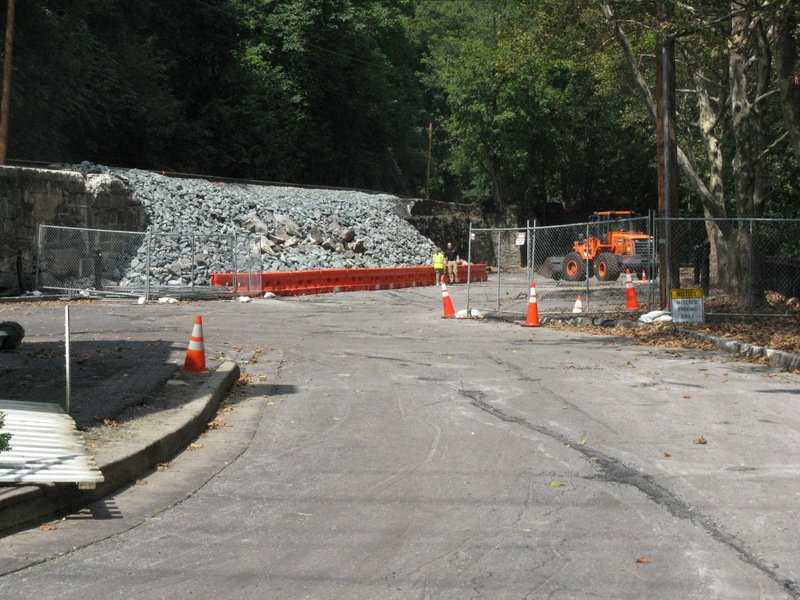 Everything is certainly compressed, but the analysis and decision making in depicting Ellicott City goes far beyond that. Geez, and we haven't even talked about selective orientation yet. More on that sometime in the future. "Give me enough time... I'll change my mind." It was with this in mind that I initially chose to build a single deck layout at an optimum height and with limited reach-in demands. But I couldn't leave well enough alone, could I? I listened to the devil, or at least to a bunch of operating-oriented modelers, and converted to a multi-deck. "It's all about the run!" Once the upper level framework and lower level backdrop was completed, I began to cut and install the 1" thick Gator Board panels as a sub-roadbed. There will be much "hacking and stacking" for land forms with the biggest challenge being the river bed on the upper level. Fortunately, this represents the western-most part of the area that I am modeling and where the Patapsco River tends to be pretty narrow and very shallow. Hooray! I also installed the upper level fascia to get an idea of what dimensions may work best. This is at 3-1/2" to allow for LED string lighting below and a little bit of contouring above. I also placed a piece of left over 6" valence to try to see what the final look may be. Although coincidental, the painted valence and fascia are almost identical in color to the Gator Board which makes it difficult to really get a read on proportions for the valence and fascia, but that will resolve itself down the road one way or another. But now I am facing a rather ambitious multi-deck layout and doing so bent over with the ongoing reminder that perhaps I took a few too many "for the team" during my many years of competitive sports. Combine these factors with a number of recent personal developments that suggest that our current home may not be our forever home, and I am bit dazed and confused. What to do? Fill in the blank: The author's excitement over his wife's increasing dialog about getting a beach home is understandable because...? A) He loves the beach, except for the sun, sand and water parts. B) His tanning cycle goes from snow-white to beet-red to snow-white. C) The basement issue could be jeopardized by the whole 'stilts' thing. D) He has yet to master the art of laying around doing nothing.